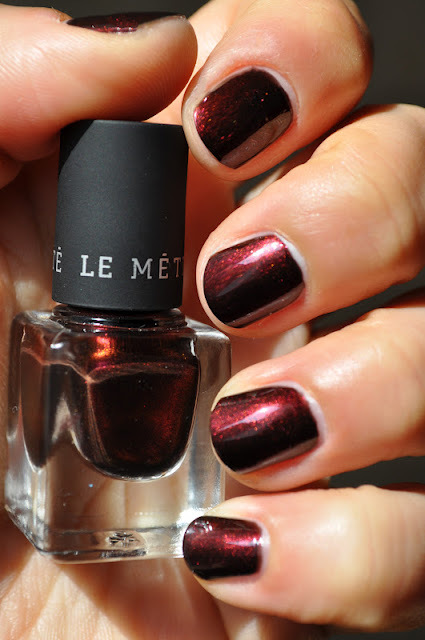 Today's mani is Le Metier De Beaute's Heat of the Night. Heat of the Night was part of the 'Rock 'n' Romance' mini nail lacquer set. This set was a Nordstrom exclusive and came out last year during their anniversary sale. Le Metier De Beaute's 'Rock 'n' Romance set retailed for $25 and included four .14fl oz/ 4ml mini polishes. I would describe Heat of the Night as being a shimmery blackened caramelized sugar maroon red, kinda reminds me of a darken sarsaparilla. I can't begin to tell you how much I love this polish. 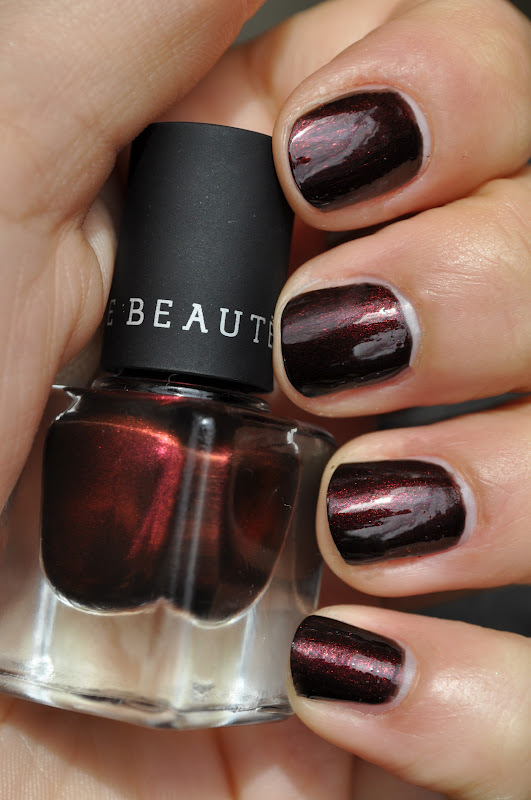 The formula of this lacquer is godsent, providing divine application. Basically opaque in one coat but my OCD required two :) While lovely indoors, Heat of the Night truly comes to life in the light (that rhymed, not intentional...); the red shimmers sparkle vividly, giving my nails this radiant burning glow. 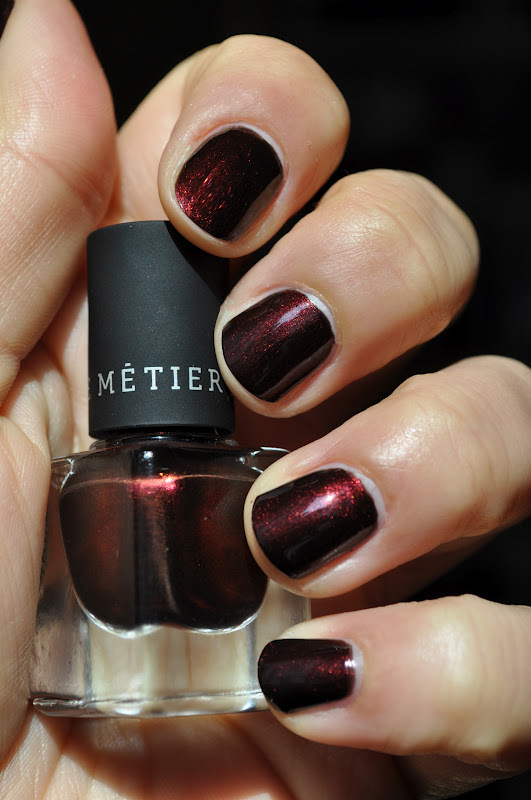 Honestly, I can't stop staring at my nails whenever I wear this polish, my little piece of decadence in a bottle. Although this was a limited edition Nordstrom exclusive, you can still get your paws on this set through nordstrom.com. As I was checking on it's availability, I was surprised to find that it was still available. I highly recommend this is set, you won't be sorry!!!! 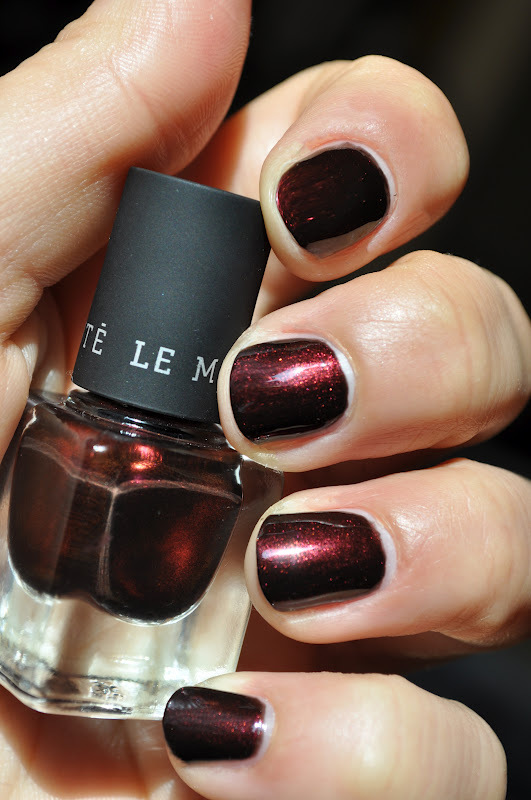 this is such a gorgeous shade. love the shimmer it has. :) your blog is lovely. love the background and design. :) i am blog-hopping BLT blog and so glad i visited here. you have a new follower, and i'd be honored if you decided to do the same. wishing you all the best on your blog, and yay for blog-hopping! have a great wknd!